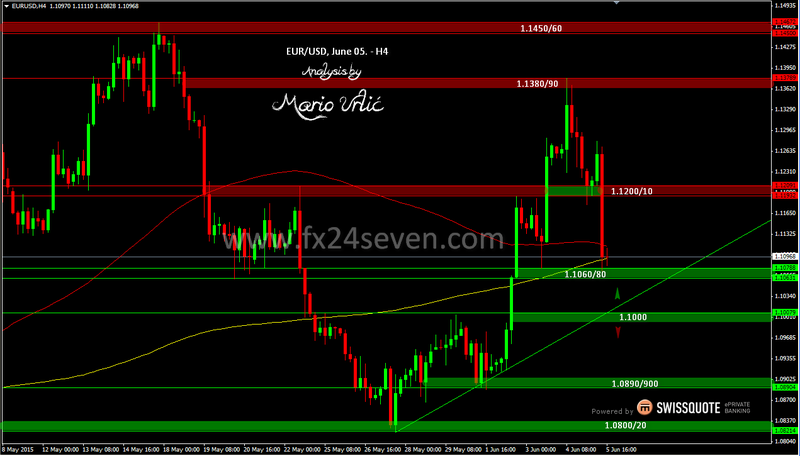 EUR/USD, NFP pushed the pair to the buyers teritory, again! But, can the buyers defend this level now, or the sellers will manage to brake true!? Well, it will be interesting to see this batlle now because, all the way to 1.1000 could be filled with long orders and turnover from this level is possible. Strong 280K NFP data pushed the US dollar all over the market, but unemployment rate is slightly worst than the previous one, 5,5% vs 5,4%. Could this numbers change anything in the FED policy? As I see it, not until the end of the year. But, when it goes, it goes. Let’s see where the euro will end this week. It had opened at 1.0886! Daily MA 100 is placed at 1.1069! I still remain very skeptical that the FED will be raising interest rates anytime soon. The NFP figure itself was another good one with only a very marginal revision down of last months figure. Also the average hourly earning increased beat market expectations and increased by 0.3% which may have made up for last months disappointing figure. However the real disappointing result was the increase of the unemployment rate to 5.5%. This may just be that since the economy is looking in better shape, more people are entering the job market and hence the rise in the unemployment rate. The question is whether this is enough to spur the FED into raising interest rates while inflation remains so firmly anchored. I think that raising interest rates now could put these very encouraging figures in jeopardy. Nothing would be worse than to kill these figures by a premature rise in interest rates. With inflation being so firmly anchored, I do not see that the FED is under any pressure to raise interest rates and will be following the recommendation of the IMF and not raising until at least the start of next year. Thus I remain neutral to bearish the Dollar and I see the EUR/USD retaking Friday’s losses and making further gains.